Screen grab of Jim Rice from NESN’s program “Jim Rice: Journey to Cooperstown”. NESN didn’t sugarcoat Jim either – not even in the brief time they gave the show – we got to hear various Boston sports writers complain about how awful he was to them. Dan Shaughnessy made an appearance (is it written somewhere that any time a film is made about Boston sports that he has to be in it? Aren’t there other writers with as much experience and talent who could pitch in?) to tell us all that Rice’s issues with the press were unwarranted. But there was also Dennis Eckersley Jerry Remy and Carl Yastrzemski as well as his outfield partners Dwight Evans and Fred Lynn to tell us what a great player he was. It really was about as balanced a piece as you could ask of the station that employs him. One of my favorite parts was Eck going on about Rice’s work ethic. I know there are still plenty of players with a good, solid, work ethic – but I think that’s part of Jim Ed’s game that gets forgotten. As Eck put it “162 games…one year 163!” <- (maybe not the exact quote!) Rice was always critical of Manny Ramirez and always sang Nomar Garciaparra’s praises. One of the main reasons seems to be based on what he perceived as their work ethic (or lack thereof). While he’s also one of my all-time favorite players I also appreciate what he brings to the NESN coverage. He isn’t afraid to call players out, using himself as an example. I respect that. I’m so looking forward to his Hall of Fame induction. I’m just sorry I won’t be there to witness it in person. One last note, a special shout-out to those of you kind enough to leave comments or send emails, regarding my previous post, that did nothing but insult my looks and complain that I’m jealous of Heidi Watney. Congratulations on simultaneously missing my point and making my point. Please win, fellas. Leave Toronto on a high note (especially after what Clay did on Friday!). Leave it to Jim Ed and TC to cheer me up. Work is absolutely insane and I’m just worn out. But the news about Jim Rice, the John Smoltz and Rocco Baldelli signings, and an opportunity to meet Bronson again have kept me happy throughout the insanity. Sadly, it all hasn’t helped my brain much so I’m still struggling to be coherent. 🙂 Given that my EEI gig probably begins some time late Wednesday or Thursday this week, the timing couldn’t be worse – BUT I’m out of work from Thursday through Monday, so that should give me plenty of time to get focused and start pumping out the entries again. In the meantime, I’m taking the easy way out. * It was pointed out to me in comments on the previous post that I didn’t make any mention of Rickey Henderson making the Hall of Fame. I like Rickey and I’m happy he was elected into the Hall. But the story there would have been if he WASNT picked to make the Hall this year. My focus was on the man who deserved to be elected in many years ago but had to wait until his last year of eligibility before he got bumped over to the Veterans Committee. I make no apologies for that. * Raise your hand if back in 2001 you thought in 2009 Derek Lowe would get a four year, $60 million contract. If your hand is up, you’re a liar. * Rob Bradford is reporting that Alex Cora has agreed to a one-year, $2 million deal with the New York Mets. Cora is one of those “average” players that I have a strong affection for. It saddens me that he won’t be with the Red Sox, but I’m happy that the New York team he landed with doesn’t play in the Bronx. * Seriously. How is it January and I haven’t heard ANYTHING about Kyle Snyder’s status? There’s no one out there who can hook me up with some information? Goal for 2009: Score an interview with Kyle. Hey, it could happen! * Greg Montalbano was at the Lowell Spinners Alumni dinner last night. It was inspiring to see him there, looking so well and speaking so fondly of his time playing baseball. We need more Greg Montalbano stories. We need to hear more about the unsung heroes in baseball and not just the superstars. * Unrelated to baseball: Watching Bill Hicks tonight and then catching about 5 minutes of Dane Cook made me miss Bill Hicks (and good comedy in general) immensely. Really, people, stop lining Cook’s pockets. 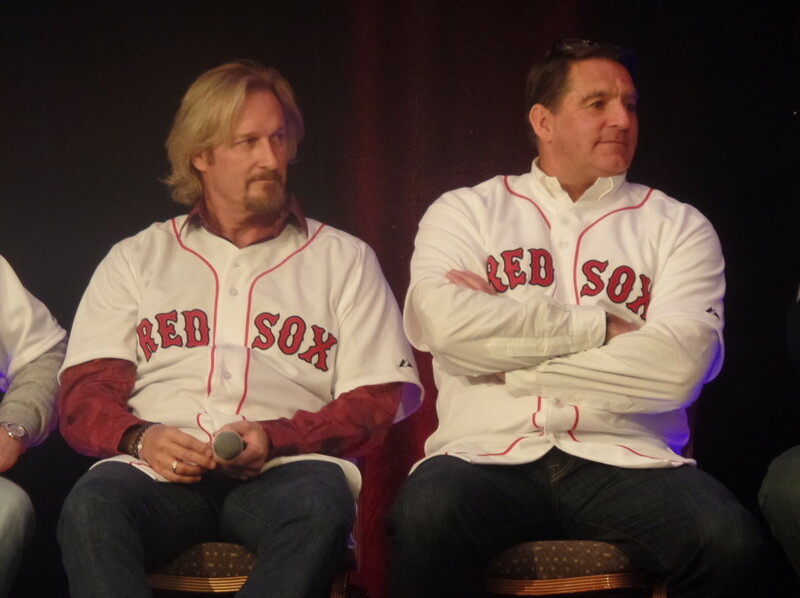 * Kelly O’Connor took some fabulous photos at the Boston Baseball Writer’s dinner AND the New Stars for Young Stars event. Go see her amazing photos here.